Recommended for applications where mirror will be extended most of the time, although it still folds very well (Adventure Bikes). -1 Ram Mount Double Socket Arm 5.2"
A little bit of vibration, not bad, way better than stock. I hate the aluminum risers, they can be a pain on the left handed threading for the throttle side. I have had these mirrors now for over a year with Forest rides as well as highway rides. They are sturdy and fold away easily. Make sure when you leave the Forest and get on the highway you tighten them otherwise they will fold in at speed. 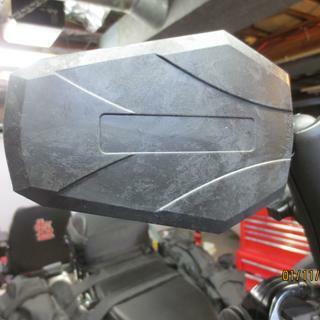 I would recommend these mirrors for dual sport riding as the materials are good quality. Downside I think they are to expensive for what they are. Just as much money as OEM mirrors but much better view and way more durable. Awesome mirror. 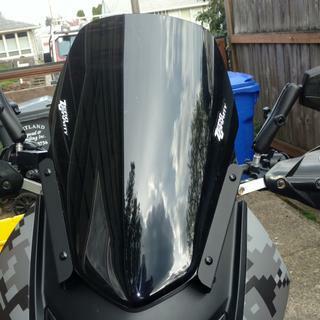 I installed them on my DR650 and they fit perfectly and vibrate less than the stock mirrors. I can also see everything behind me now and much further to the sides of my bike. The middle part of the mirror is made of metal so I don't think you could break these mirrors if you tried. First I did make the mistake of thinking that this was for both mirrors. It's in the description I just missed it, but thinking of this as $124 for both mirrors I probably would not have purchased this. So since I only had 1 mirror I have been riding around with this one installed and an OEM one on the other side to compare. Aesthetically it looks much better than stock. I like that it can be moved around in more positions than the stock one. The arm is much thicker causing it to hit my windshield when in the same position as the stock one, but some minor handlebar adjustments cleared this issue up. Field of View is much better horizontally, hands down. I can see into my blind spot without needing to lean forward a little like I do with the stock mirror. But it is also narrow vertically compared to stock. I feel like I need to focus more as objects in mirror are smaller than they were before. Now my main issue, I find it very shaky compared to my stock mirror. 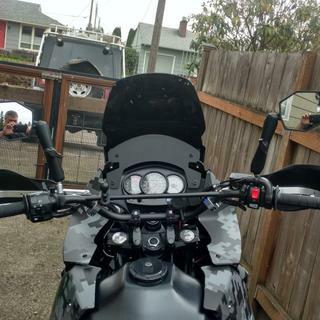 Not felt in the handlebars at all, that part is smooth, but car outlines and lighting is much more blurry compared to my stock mirror due to the vibrations at the lens (viewed side-by-side with both installed). I have this clamped down as much as I can by my hands. It hurts my eyes at night especially trying to focus and see where headlights are with the blurry/shaky outlines. It is disorienting at night for me. 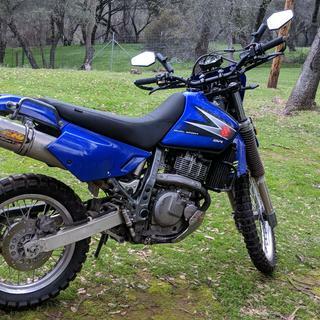 If I was riding mostly off-road this may be a good option. 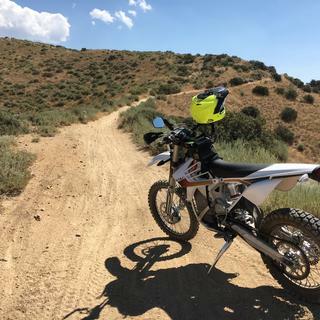 I find that I am riding about 70/30 on/off-road on my KLR and the blurry vibrations are driving me nuts, especially at night. Between that and the price I will not be ordering the second mirror for now and will be putting the stock mirrors back on for commuting. Still recommended as it is quality construction and may work better for other riders/bikes/budgets. You've seen them. You've wanted a set. These are a great replacement for low quality stock mirrors. Seriously rugged, simply adjustable. Good looking. Better field of view than stock. Great addition to the bike. These are awesome - and bullet-proof! A bit heavier/more beefy - but they always just pivot away during a crash without damage. They don't move when cranked REALLY tight (though; coming down from a big wheelie on a big bike like my 905 Adventure S, they WILL shift downward out of position) - my only gripe is that the ball gets damaged/deformed from cranking the ram-mount as tight as you need to - in order to keep them static. - I guess the 'ball mount (for threading into the bar) is replaceable, however. Love them! 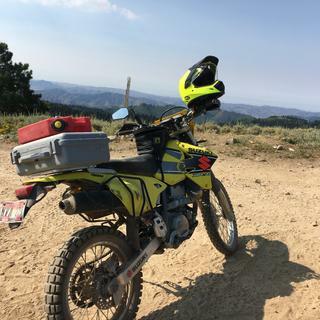 It sets my KLR right off. A must have. 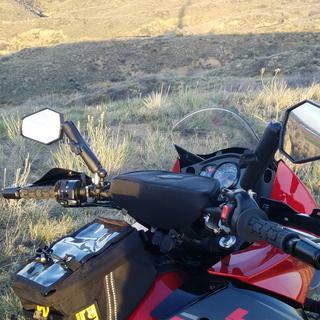 Had trouble seeing behind me with the stock KLR mirrors, when I would wear a cold weather jacket I would have too lower one of my arms to see behind me. now with the double take mirrors I have no problems seeing behind me with or with out a jacket. great buy. get ya some! Tested several times in Baja - no harm, no foul, they work! Folded every time I dropped the bike. Great product. Installed these on a KLR. Love them! One of the reasons I bought them was I read that they vibrated less, and that was correct, they don't vibrate near as much as the stock mirrors. Plus you have a wider field of vision. Highly recommend them! Best mirror currently available, a little vulnerable to theft.. I really like the ease of being able to quickly adjust this mirror down tucked away against my handle bar pad as I don't always need to use it. It very durable, I hit a tree branch with it pretty good and no damage. These mirrors are awesomely brilliant. The ram mount technology allows for easy adjustment with huge range. Easy to move out of the way or remove. I haven’t put many miles on them but they have a lifetime warranty and look like they’ll hold up. I’d recommend trying them. Awesome mirror for adventure riding on any bike. Easy to install with RAM mounts. These things are way better than the stock mirrors. I can actually see what's behind me when riding down the road. Plus I can tuck them in before hitting the trail. I have a Triumph Explorer so, I ordered a set for Honda XR650. They have the same thread on the stock mirrors. I spent less on other mirrors but they would vibrate a lot distorting my view and would break fairly easily when I would lay the bike over. 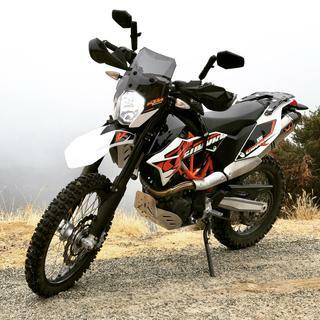 I ride a 2016 KLR 650 so dropping the bike and heavy vibrations should come as no surprise. Soooo happy I spent the extra money on these mirrors! Hardly have any vibrations, much wider views, and FULLY adjustable so I can get them out of the way when trail riding. Well worth the extra money. I really like this mirror kit. As you probably know, the sockets, and stalks are from Ram. Almost no vibration/ blurry vision. The mirrors themselves are fine, no issues, and seem heavy duty. The price was hard to get over, but you get what you pay for. I think they were worth the money. 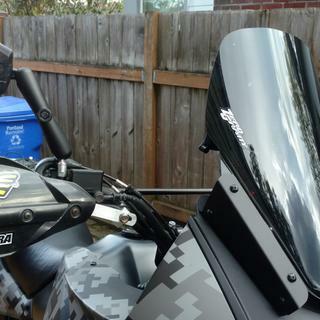 With cheap standard mirrors, if you drop your bike on the right side and snap your m/c off, well, your day is over. These will just move back to where you want them. Only issue I had was with the little black plastic ball w/ the aluminum threaded base. There are no "flats" on the Al. base to tighten ball into adapter. I used a small needle nose vise grip pliers on the shank. Yea, it put a few gnashes on it, but I'm ok with that. The adapter (that goes into your perch) however does have flats. I also used blue locktite. Nice kit. You'll be happy with these. This purchase was well worth it. Directly mounted to already existing threaded mounts on the handle bars on my Suzuki Kingquad 500Axi 4x4. 10 minutes to install and adjust the view. Great buy Very sturdy and durable against tree branches along the mountain trails. Let’s me keep an eye on my wife and sons following behind me. I definitely would recommend this product to everyone. Price was on point ! I broke the right side stock mirror in a tumble and it shattered beyond use. I wanted a mirror that could be expected to stand up to the inevitable falls and scraps. The Double Take mirror moves and adjusts many ways to allow me a better view behind me and will give when I fall. At first I was not so sure about spending the money on a better mirror but it is worth it if you plan to ride on the roads and trails. Last mirror you'll ever buy! 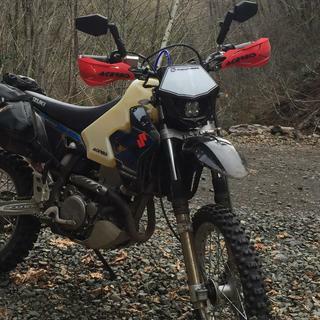 I really didn't like the stock mirrors on my KLR 650. About the only thing I could see in them was my shoulders. These Double Take mirrors cured that problem pretty fast. As you can imagine, installing them was super fast and super easy. As for durability, I accidentally dropped one of them when taking it out of the package onto a cement floor. Didn't even make a mark on it! These things will adjust any way that you want them to, with only the twist of a sturdy wing nut. I think that they look great too. Love the larger view and adjustability. 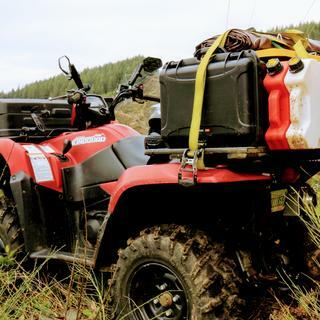 Durability will be tested during the summer, Buck and Bull season. Love these mirrors super easy to mount and look way good. Worth the money. They are durable and the fold out of the way. I broke 4 stock mirrors between my DR650 and DR200... I am yet to break a single one of these, and I certainly haven't stopped crashing irresponsibly. 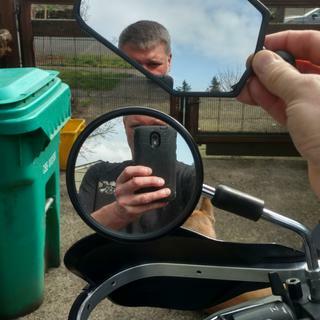 I have a 2005 KLR 650 and would recommend these mirrors to anyone. They are well built, easily break away when contacting objects yet are easy to put back in place. They give a wider field of vision than stock, do not vibrate on my aluminum bars and are infinity adjustable. I cannot say enough good about them they are well worth the cost. 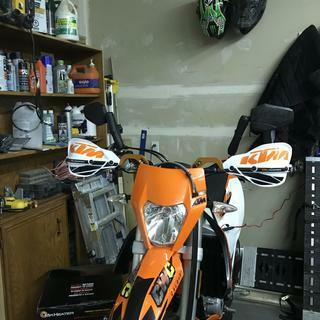 I purchased these mirrors to replace the stock DRZ mirrors after having cracked one of them. The adventure mirrors look much better than the enduro mirrors and I get a much larger picture of what’s behind me with these. Great quality, sturdy, and resilient! My only gripe is that they vibrate quite a bit more than the stock DRZ mirrors that I’m used to, so the headlamps behind me on road riding just look like blobs of light. I would buy again. 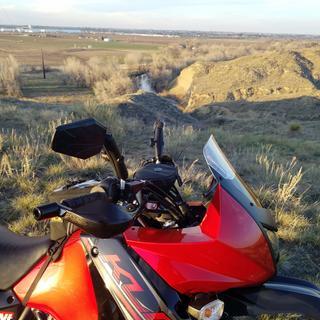 I ride mostly street, and the tiny stock mirrors on the KLR are a joke. First off they are small, and second you can't see around your own shoulders. Replacing the stock mirrors was a must and the Double Takes are wonderful. 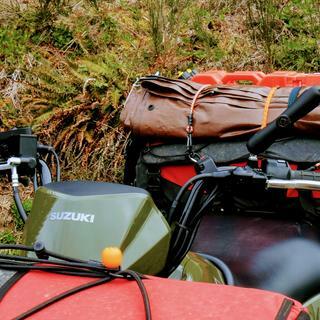 I love that when I do go off road, I can fold these in to avoid impacts with limbs and ground in the event the KLR wants to take a dirt nap. They are highly flexible to put the mirror where you need it, or take the mirror off and put any other 1" Ram Mount accessory in its place, like a GPS or action cam. I was confused about what this kit came with, but it came with everything to replace the mirror on one side only. if you want to replace both mirrors, order two. Bought these for better vision on road and for durability off road. Having taken them off road and hitting sticks, branches and trees I can say they are great. The ram ball mount does need to be put in with some loctite but after that it is great. The mirrors are tight in place but still able to be pushed out of the way if you forget to tuck them in before heading off road. These fit my DR650 very well and should work fine when I get a chance to ride with them. However, as these pics show, the finish of the plastic is terrible, as if something has etched the fronts. Yes, they will get dirty when I do ride off road, etc, but these have never left the garage and look terrible. I take pride in taking care of my bikes and it is a shame to start out with a pair of $100 mirrors that look as bad as these. 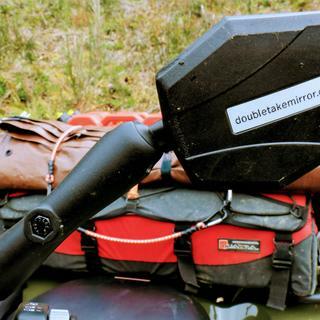 Premium mirror for a rugged bike...a must for the dualsport. You can actually see behind you with these mirrors, they tend to move a little think I will try ruffing up the pivots a little should fix it. putting in the adapters you cant get a wrench on them so I used pliers which marred them a little. These work great. Very durable and keep their adjustment. Also handy to swing out of the way when cramming bikes into enclosed trailers. These are awesome mirrors. Took me just minutes to install and I can finally see behind me without moving my arms. Adjusting them is super easy and I am pleasantly surprised how much they help me see. when I 1st put these on I didn't like the looks so much, too bulky... after riding with them the performance changed my mind, they're very stable and much more adjustable. if you decide to stand up for a bit you can easily readjust them on the fly, or fold them in out of the way. So good, you won't go wrong with these. Get two there fantastic over stock, no comparison just do it! Absolutely love them. Put this on my 2007 KTM 525 Adventure bike. Then have worked better than any other I have used. Perfect fit for my 2014 KLR650! Probably one of my favorite "Farkles" for my KLR650. Easy install (it comes with risers to get the Ram mount up above your cables just the right amount), easy adjustment, and I love that they can be moved out of the way for off-roading. The mirrors are the right size to see past my shoulders without sticking out too far. The glass is clear, and you just can't go wrong with the Ram Mount system. Best aftermarket mirror out there! This thing has very little vibration, making it easy to see. It is a little bit bulky when you try to hide it down for off road use, but it is worth it on the road. Solid construction, unit can take a beating. 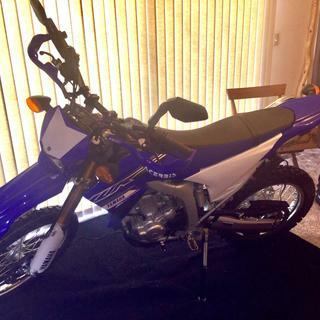 Perfect for dual sports/ enduros. Fold it in for trails, fold it out for pavement. What's not to like. 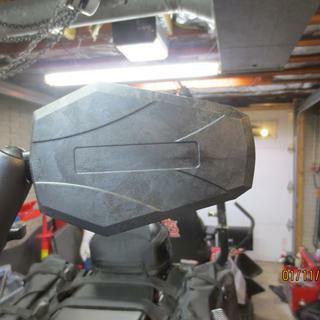 Ordered part number 1606650001, and it fits the factory mirror mounts on my 2013 Suzuki Kingquad 500, and 750. Gone are the days of buying $10 mirrors that break every other ride. These are worth every penny. Hard to tell if this comes with the handle bar mount hardware, too. Does it come with all the necessary items to mount it to handlebars? BEST ANSWER: Howdy I have purchased both kits that RM offers , one is a long arm , 5.2" supplied without a split clamp and the other is A shorter arm and is supplied with a split clamp . The best way I have found to avoid confusion is at the listing scroll down and RM gives a list of all that is included with the pictured item, the picture with your question is the 5.2" kit and Doesn't include the split clamp . The split clamp part # is 1508060001 and cost $5.00 this for me is the best way to go, long arm kit and adding the clamp separate. If you have existing mirror mounts, then you should be able to mount them directly with everything included in the kit. 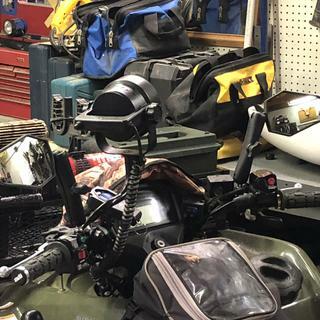 If you don't have mounts (on your kill switch, turn signals or other handlebar controls) then you'll need something with a standard threaded insert. What you see in the pic is what you get. That depends. If your bike has a female adapter on the handlebar, the bar stud screws into the adapter. If your bike has no adapter, get the Double Take Universal Kit. Actually, it is cheaper and has more parts. The Universal Kit comes with a 7/8" Split Clamp Assembly that mounts on the handlebar. It comes with the mirror, the arm and the ball. The ball is metric, M10 x 1.25. You would need something such as the split clamp assembly to thread the ball into if you don't already have mirrors on your bike. These are awesome mirrors, btw....if you buy them, you won't regret it. Hey if you mean the bae clamps to attach the ball mount too the answer would be no. But in my case on my KLR650 That was OK what I did was used the SW Motech mirror wideners mounted to T original mirror mount locations. Then attached the ball mount to them. The ones I bought for my 2009 KLR 650 only had the threaded stud that would go in the oem mirror mounting location. So I would say no to amswer your question. Kit comes with everything needed...the ball-mount screws into existing mirror mount hole. I bought 1 and didn't have to buy any other parts- works great! It comes with the short mirror riser (not an offset) that screws into you existing mirror mount. It does not come with a clamp to mount to the bars. It does. The ball mount screws into mirror mounting hole. I bought 2 and didn't have to buy any other parts. What you see is what you get. You do not get any clamps. I screws into the existing mounts if you had mirrors. If your bike has mirrors already and the mounts are 10mm this kit is all you need. Mirrors work great. Yes comes with all that is needed for a KTM 690 which I put on my KTM 640. BEST ANSWER: They screw in where the old ktm mirrors were. If you didn’t have mirrors then I’m not sure but don’t think it would be a big deal to adapt them. Best mirrors you can get. 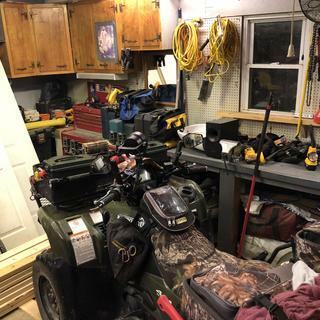 I installed on 2018 Husqvarna 701 Enduro. 5 minutes, nstallation, very essy. KTM handlevars mirror mounts are similar. You ahould have no issue. Will fit anything with 7/8" bars, and room for the clamps. It's a RAM mount so you are sure to find an adapter to reto fit existing mirror mount. Yes they will, the threads are the same, you will like these mirrors top quality. Yes, I have them on my 2018 500. Does this item fit a Husqvarna 701 SM or Enduro? BEST ANSWER: I purchased this kit for my Yamaha WR250R which the stock mirror mounts were M10 x 1.25 threads. If the 701 has the same thread size then these will fit. My kit came with a Double Take Base Extension which fail after a few months of riding, poor metal quality and not material between the stud and socket. The extension is not really required. It will fit any bike if you have the space on the bars. 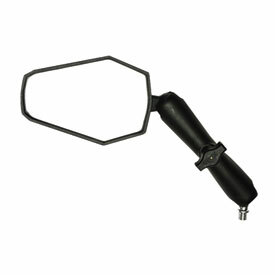 You also need the clamp that fits the bar and then the arm screws down in to it. They work great and look nice. Easy to adjust and they stay put too. Hope this helps.I don't know if they fit the stock bike mirror mount. Absolutely screw out the old mirror mount, screw in the new mount. Does this come with both Mirrors or is it just one side? BEST ANSWER: Each side is offered independent. It is a single set for one side. It comes with 1 mirror, which can be used on either side. So order quantity of 2 units. One mirror can be used on either side. One mirror can go on either side. Do you have them for a 2017 Honda CRF250l? BEST ANSWER: Unfortunately this will not fit your machine. The ball stud included in the kit absolutely does fit the 2017 crf 250L stock mirror mounts. You simply unscrew the stock mirrors and screw in the included ball stud (maybe use some loctite).